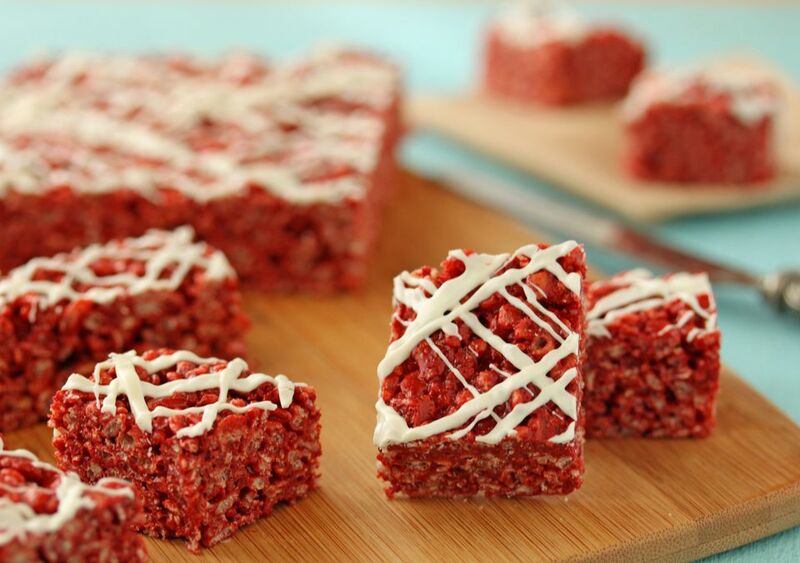 Red Velvet Crispy Treats are easy rice crispy treats, flavored like red velvet cake batter! Drizzle them with a little white chocolate to complete the comparison. You'll need a little dry red velvet cake mix to make this recipe, and if you're looking for ways to use up the remainder of the mix after making these cups, check out the other red velvet candies listed down below this recipe. Line a 9x13 pan with foil, and spray the foil with nonstick cooking spray. In a large microwave-safe bowl, combine the butter and miniature marshmallows. Microwave them for 1 minute, then stir. If the marshmallows are not completely melted after stirring, continue to microwave in 20-second increments until they're totally melted and the mixture is smooth. Add the vanilla extract, then sift the red velvet cake mix and cocoa powder over the melted marshmallows. Stir until everything is well-combined. Add the rice cereal to the marshmallow bowl and stir until it is coated with the marshmallow. Using a nonstick spatula, or spraying a spatula periodically with nonstick cooking spray might make this job easier if you find it difficult to stir. Scrape the candy into the prepared pan and press it into an even layer. Allow it to sit at room temperature until cool. If desired, melt white candy coating or white chocolate chips in the microwave, and drizzle it across the top of the crispy treats. Let it set completely, then cut the treats into small squares to serve. Store Red Velvet Crispy Treats at room temperature for up to a week. Click Here to View All Cake-Based Candies! Turn Cereal Into Candy With Cheerio Clusters! Paycheck Candy Bars - Peanut and Caramel PayDay Copycat Recipe! Candied Bacon - Your New Favorite Snack!